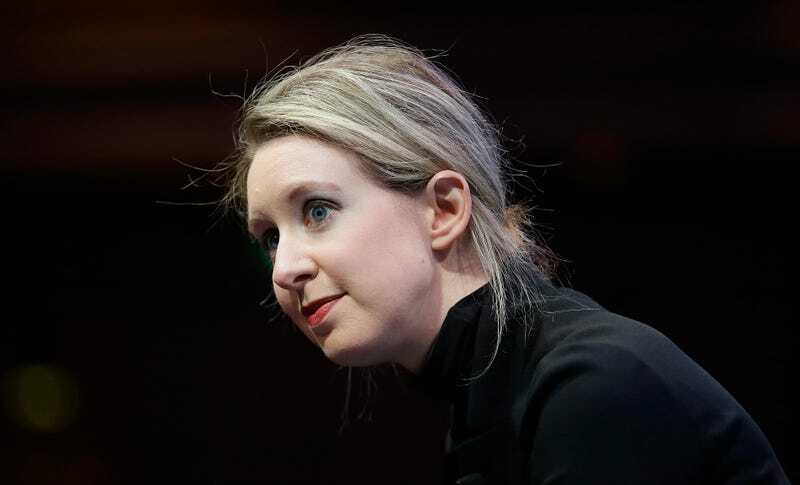 Elizabeth Holmes, Theranos CEO and founder, our favorite blood-fearing, turtleneck-loving, disruption-preaching and increasingly fraudulent-looking biotech entrepreneur, appears to be facing a blanket ban from her own business sector for at least the next two years. This letter—which the Wall Street Journal reviewed in writing, but does not quote directly—gives Theranos 10 days to address CMS concerns before the sanctions are imposed: “The company has responded, and CMS is reviewing the response, according to a person familiar with the matter,” writes the WSJ. If the company doesn’t respond to the regulators’ satisfaction, the CMS will go ahead with the sanctions, which could be in place in anywhere from 8 to 60 days—and longer, if Theranos appeals, which seems likely, given the company’s history of proclaiming that everything’s fine despite compelling evidence to the contrary. [...] CMS also proposed to fine Theranos $10,000 a day and said it wants the company to submit the names and addresses of all doctors and patients who used the lab’s services since January 2014. “The proposed penalties are among the most severe in CMS’s power,” Barbara Cammarata, a lawyer in the field, said to the WSJ. Greg Ingle, a chief executive of a lab-auditing firm, told the paper that it’s very unusual for the government to revoke the licenses of a firm like Theranos, which is large and heavily, famously capitalized. The full 45-page letter may or may not be released to the public, depending on whether or not Theranos’s usual strategy—asking for nondisclosure in the interest of protecting trade secrets—works. In this case, the company has requested redactions to the letter. Theranos continues to be a fascinating case study in what the combination of an irresistibly “disruptive” idea, an unusually compelling central character (Ken Auletta’s 2014 New Yorker piece on Holmes explains this terrifically), and a perfectly packaged narrative can do to get people to suspend skepticism and disbelief for a long, long time.